Last month I competed in 3 regattas. This isn't a big statement except it's been many years since I've raced so I wasn't sure what my skill level would be and I also wasn't sure what was happening in the world of racing windsurfers. I really didn't know what I was stepping into after all these years. One of the races required an 8 hour flight to Europe, another required an 8 hour drive around Lake Michigan and the third took me through the fields of Ohio. 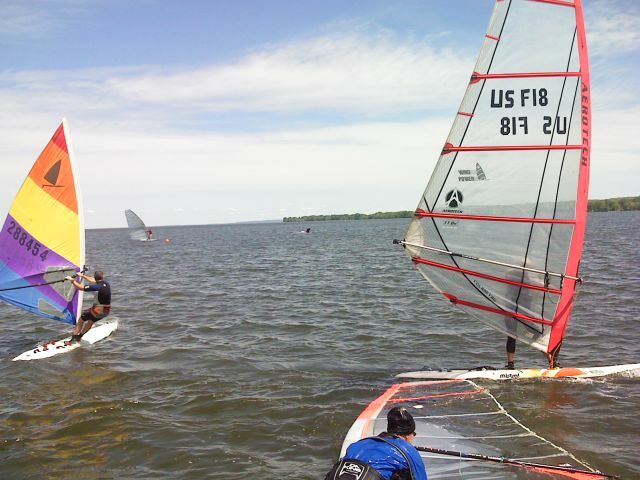 But it wasn't the event's location, body of water or wind that made these regattas different. It was something equally as fundamental. As I recap the events below you'll read about the differences and I hope come away with a refreshed perspective on windsurfing, racing and equipment. 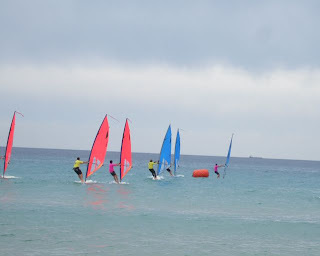 The Windsurfer One Design Team Sailing Championships were held May 7th & 8th during the Chia Waterman event on the island of Sardinia, Italy. There were 6 teams, each with 3 sailors. All teams competed on the same equipment–new Windsurfer One Designs with: beautiful sails, clamp on booms, retractable centerboards and adjustable mast tracks. The racing was very competitive but the mood was light and fun. I found myself giving each race and each moment my full attention and all my energy. After six races our team made it into the finals. We sailed hard and smart, making it as difficult as possible for our opponents. The finals were so close at the finish that the Race Committee had us sail another race to determine the winner. Before they announced there would be a final-finals race I felt exhausted; my hands were blistered and my face wind and sun burned. Luckily my sister Tara, who joined me for this trip, had some food and water in her bag so I refueled and made my way to the start line. Thank you Tara. I was engaged and didn't want to slow down now for the final-finals, even though I was showing signs of how long it had been since I had been racing. 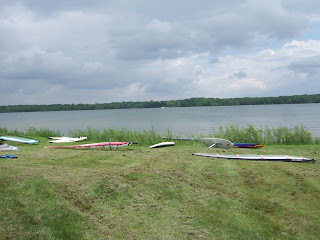 Because all competitors were using the same equipment, these races were about the ability to negotiate a position on the start line, cover your opponents, read wind shifts, tack quickly, help your teammates, obtain inside overlap at the marks and execute a fast jibe without loosing your boat speed. Even if a team didn't make it to the finals, all competitors left this event with their sailing skills sharpened. I am proud to report our team finished 2nd. We placed 2nd not because we had last years equipment or because we used the wrong sized sail, but because the other team as a whole were better sailors that day. Returning home to the United States dodging the volcanic ash covering Europe, on May 15 & 16, we (my sister Tara & my dog Roscoe) drove about as long as the flight to Europe around the upper part of Lake Michigan to The Walleye Wagatta (named after the opening season for the Walleyes) on Lake Winnebago in Fond du Lac, Wisconsin. 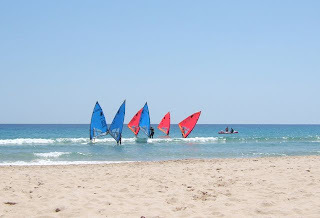 It's organized by MOWIND and Wind Power Windsurfing. Thank you to the Race Committee that did a top-notch job. I brought what I had to the regatta: an older Windsurfer One Design board from mid 1980s with a Windsurfer 5.2 sail from the late 1970s. Most of the 27 competitors had 8.5 or 11.0 rigs combined with high volume boards. There were also Division II boards. Conceptually and technically these boards are very different from the Windsurfer I was sailing which is a low volume board with a smaller "soft" sail supported by late 1970s / early 1980s technology. When I began to rig up the morning of the race and saw everyone else's equipment, I thought to myself, "this ought to be interesting...." I've never raced a Windsurfer One Design against anything but Windsurfer One Designs, this would be a first for me. I felt like a caveman that had been transported 30 years into the future of windsurfing. What new things will I learn from these sailors with all the newer high tech equipment? The first thing I noticed were the sails, they were fully battened camber induced. I also noticed the colors, or lack of; these sails looked very serious and expensive, like a sail I'd expect to see in America's Cup racing or being used to break a speed record, they were mostly transparent with some grey. 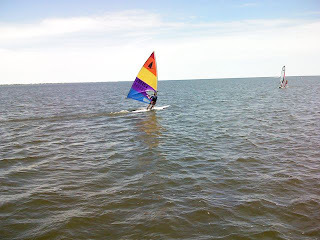 It was going to be easy to find me on the water because my sail is one of the most colorful sails Windsurfer ever made: stripes of purple, yellow, red and orange cover the entire sail. And the best part is that there is a matching equally colorful streamer for the top of the sail. I believe streamers were made to compliment the festive nature of windsurfing, they are purely cosmetic. When I took the streamer out of my sail bag I stuffed it back into the bag before anyone could see it. Based on the equipment I observed around me, this group was not the leisurely colored sail-with-a-streamer crowd (although once I got to know them better I think they could be!). The wind was light to moderate as I left the shore and sailed out towards the course. 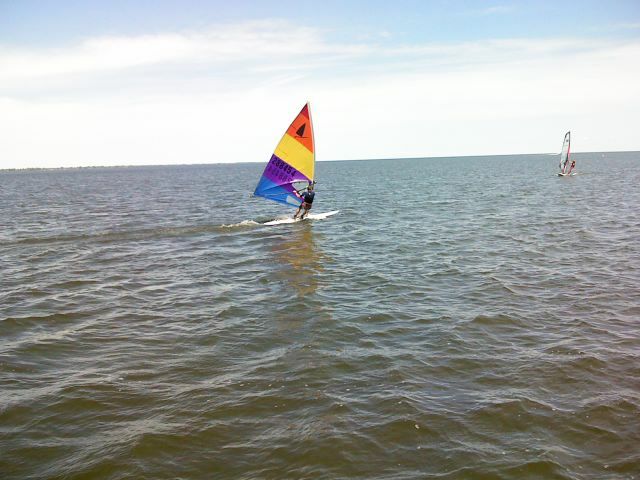 I had recently adopted this Windsurfer One Design for about $150, this was my first time sailing it. Everything felt fine but something was wrong on the lake. I looked around and noticed that everyone was hooked into their harnesses, except me. They were moving along at a good pace, but no one was hanging from their booms, they were all attached. My vintage Speed Seat harness floats too low on my hips for me to hook-in with light wind, and besides why would I want to hook in when I can sail! 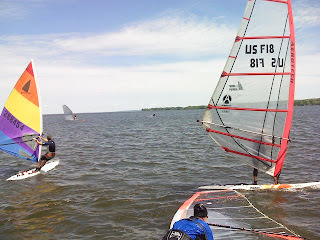 Duck tack, rail ride, back to sail, power jibing – I was having a blast doing tricks and warming up before the start. The course was set and the starting sequence began, most of the fleet hung back away from the start line. I wasn't sure why they weren't jockeying for the best position. There was one start for all classes. I was registered in two classes: the Vintage class and the Limited 8.5 class. Vintage is for old-school-equipment; there was me and Andy, he was on a Whaler. In the Limited 8.5 class you can race anything so long as your sail isn't larger than 8.5 so I am racing against sails that are up to 63% larger than mine. And because there is one start for all classes, I am also racing with 11.0 sails that are over 110% larger than my sail. I reminded myself I was there to have fun, meet new people and sharpen my sailing skills. I am going to be dead last. The start horn blew and the division II boards with 11.0 sails lurched ahead, out pointing the rest of the fleet. I tacked quickly away from their cover and headed for cleaner air. Out of the corner of my eye I could see the fleet; hardly anyone else was tacking over, I wondered why. As the wind shifted I tacked, again and again making my way up to the windward mark. As I approached the mark and began to join the rest of the fleet I thought, "Hey I am not doing so bad, I am in the top 5 of my fleet" Sailors were tacking their boards in slow motion on the lay line to the windward mark. As I rounded the mark sailors in front of me were struggling to maneuver and jibe their boards and rigs. I suddenly realized what was happening all around me; the weight of the rig and the high volume board made tacking and jibing a labor. As I made my rounding between the sailor ahead of me and the windward mark I realized my rig had never felt lighter and my board more attentive. On the way to the leeward mark I lost a few positions to the larger sails but as I rounded the leeward mark I knew the upwind leg was my chance to catch up. As the day progressed I began to finish in the top 5 and was even first to the windward mark one race. Many people asked to try my Windsurfer between races and I in turn sailed on their boards for a few minutes but towards the end of the day their rigs were too heavy for me to pick up so I just sat on their board while they sailed my Windsurfer One Design around. One of these people was a young guy who even did some tricks. He told me about a downhaul crank that makes trimming his large sail much easier. I asked him how much the down haul crank costs and he said about $125, which made me appreciate my recent Windsurfer adoption even more. 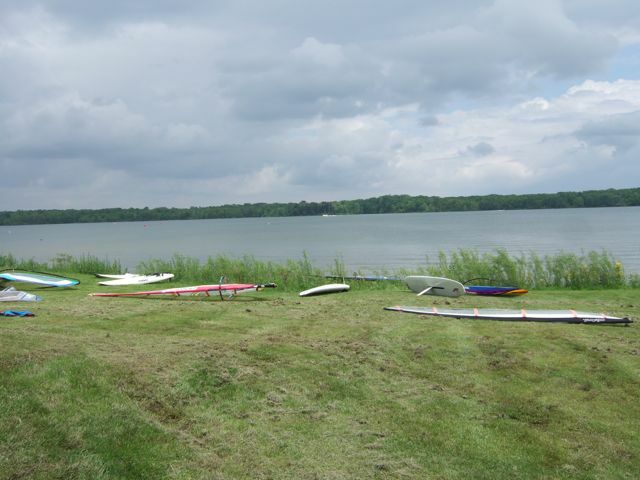 The third race I went to was held May 22 & 23 at Alum Creek in Ohio also put on by MOWIND. It was the same format as the Walleye and again the Race Committee did a great job. This event has been going on since the early 1980s and is one, if not the oldest regattas in North America. There were 9 races on Saturday in 6 to 8 knots of wind with some 10 knot gusts. Thanks Paul & Chris Sandstrom for keeping it going! Again I had some great races and great competition! Having never sailed a Windsurfer One Design against other (newer) boards I really didn't know what to expect. 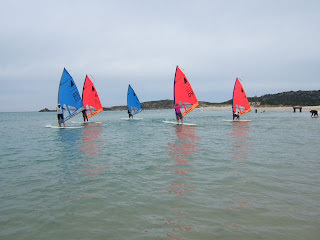 Let me share with you that I left these races with a renewed appreciation for the design of the Windsurfer One Design and a greater appreciation for the boards original concept. 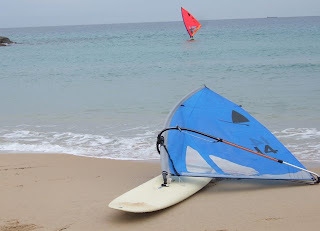 I've seen some of the prototypes that were developed at the same time the Windsurfer One Design was being developed, and some were high volume boards. One that was named "Big Red" was even like a division II board and some were even super wide boards. But there's a reason they remained prototypes. I believe the concept behind the original, the Windsurfer One Design, still provides the best all-around sailing experience for the sailor on and off the race course. In fact while driving home after these races I called Hoyle & Diane to share my enthusiasm and let them know how impressed I was with the original Windsurfer. I think in a way it wasn't just me acknowledging this, but all the sailors I've spoken to and emailed who've shared their stories with me; their love affair with windsurfing and their passion for the original Windsurfer. 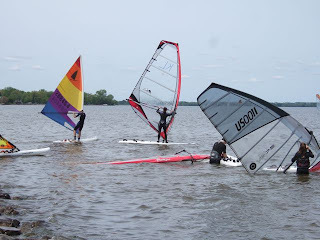 ps- Just received shipment of new Windsurfers so I'll be at the Patterson Park Regatta in Grosse Pointe Park, Michigan on June 19th with a NEW Windsurfer. If you want me to bring an extra one for you to sail, let me know.